The two most common questions I am asked are "Why am I always tired? ", and "Why do my joints hurt?". I hear these two questions on a regular basis. Before I get into my belief, I will have to say that I am NOT a certified nutritionalist, nor am I a certified anything. All of my knowledge is based on my personal experience going back to the mid 70's. From my experience, sugars and starches are the biggest culprits of both questions. Dairy, for me, is also a culprit (Which makes me sad, for I love cheese). These foods are inflammatory foods. The word speaks for itself. Sounds pretty simple, except for the fact that all foods that are enjoyable to eat for the average person are in those categories. If I ask someone if they eat greens, or have ever juiced greens, they will come back with the answer yes. Then when I ask what kind of greens or greens juice, well, the answer will be "I eat my broccoli." When it comes to the juicing, it will always include carrots, cucumber, apples, beets, all of which contain sugars. The answer is simple, but the discipline of doing is definitely not. There really is no way I can help someone if they don't understand one must be disciplined enough to make it a daily regimen. I understand that most people no longer have time when it comes to their food preparation, but, hey, the down time from aches, injuries, and illness kind of add up, and sometimes will be longer than those few minutes in the kitchen. Yes, there are all kinds of greens powders, as well as bottled greens in the refrigerator isle of the grocery store. But one must take care to read the ingredients. First of all, if it tastes yummy, it has fruit, and usually it is pear, or apple. Well guess what? That will make you tired. I guess some greens are better than none, but if you have the joint pains or getting sleepy, check the ingredients on your store bought source. Now my only suggestion is fresh juice. And I mean GREEN juice. 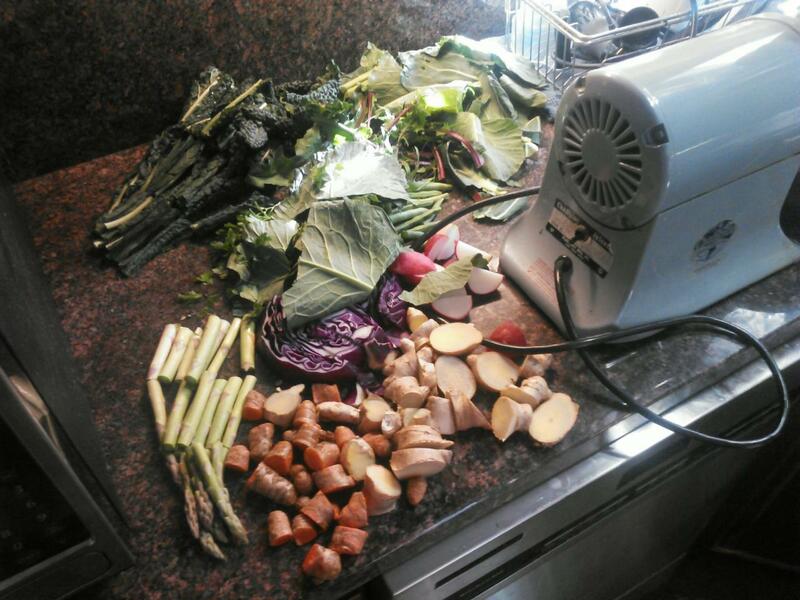 My recipe is Kale, Collard greens, Swiss Chard, Dandelion leaf, Parsley, Asparagus, Cabbage, and LOTS of Ginger root. Organic, of course, and always washed, unless you have your own garden, then just pick it and juice it. This combination is a complete multi vitamin, which even includes the best bio-available calcium. It is an extreme anti-inflammatory concoction that is a guarantee. These greens also contain enzymes that help digestion of proteins. For example, I eat red meat every single day for breakfast. My first meal is always a few ounces of bison, grass fed beef, or venison. Always eaten with the green juice. In my humble opinion, the best power breakfast on the planet (I will get into my opinion on red meats in another blog article). Any proteins will assimilate to its full capacity if taken with this combination of juice. If you are going to try to start this type of regimen, You will first need a good reliable juicer. For over thirty years I have use only one kind of juicer. It is called a Champion juicer. It is under $300.00 and will last forever. Additionally, you can make your own nut butter with this juicer. I get no perks for pimping this product, I just love this juicer. It is affordable, and if any of the parts need to be replaced they are under $20.00. But it takes a very long time before anything will need to be replaced. For anyone that "HATES VEGETABLES" You CAN start with baby steps. Even though they contain sugars you can start with putting carrots or "Granny Smith" apples, and add the previous mentioned little by little. This will also ease your stomach into it. To this day, every time I down my juice I get squidgy face. Mainly because of the heat of the ginger root, as well as the bitterness of the greens. All of the mentioned greens are "liver loving" greens. This....is my simple secret. It is a simple answer for anyone, I mean anyone, who wants to have a better healthy life. I am sharing this because I am constantly asked how I stay so healthy and look so healthy. I am humbly sharing my nutritional regimen, for this reason and no other. Next, I will address my experience with fats.